This post brought to you by Sterling. The content and opinions expressed below are that of Mom Fabulous. In an effort to save money and use simpler, better for us ingredients – I’ve been looking for different ways to make my own cleaning products. It’s definitely been an experiment. Some have turned out great and some haven’t. My daughter has also been using items you can find in our pantry to make her own face scrubs and cleansers. She’s definitely noticed a difference in her skin. One thing I realized I could also make myself is homemade dog shampoo. That’s one less thing for me to buy! It’s so easy to make it’s ridiculous, plus it works. All you need is 1/4 cup dish detergent, 1/2 cup white vinegar and 2 cups of warm water. 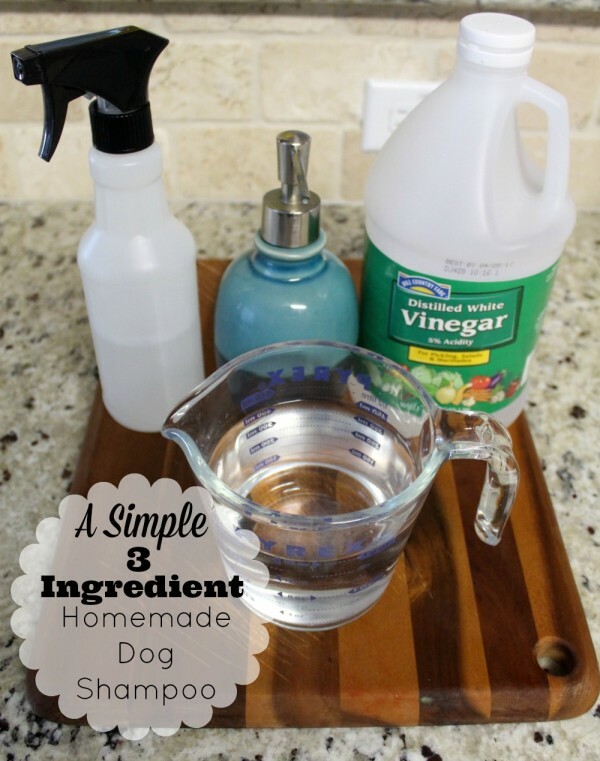 Combine the water and vinegar in a spray bottle, add the dish detergent and shake gently. Bubbles will form and that’s a good thing! Wait for the bubbles to settle a bit and then you can use it on your dog. Easy peasy. 1. Find a good shampoo or make your own. 2. Do not wash your dog too often. It’s recommended that if your dog doesn’t get muddy or too stinky, to only wash him/her once a month. 3. 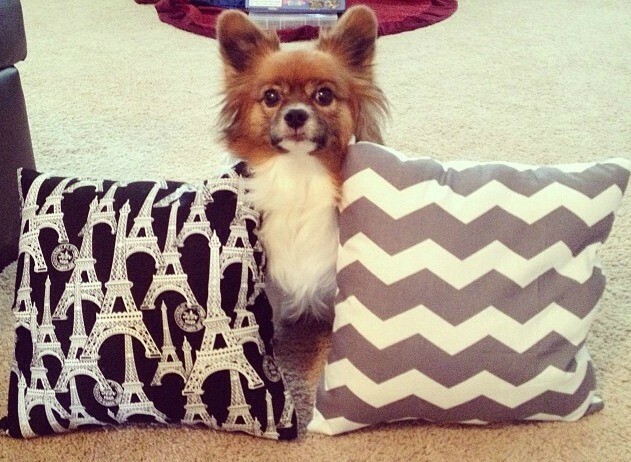 Make your dog as comfortable as possible. Speak to him in a soothing voice. Give him a treat or toy to play with. You want bath time to be an enjoyable experience for your dog, so he associates it with happiness and not downright terror. 4. Make sure you’re comfortable. We’ve had several homes with shower doors which made it uncomfortable to bathe our dog and small children. You have to lean on the sharp and uncomfortable metal part. Sterling Prevail sliding door has a flexible track, which makes it comfortable and easy to clean. 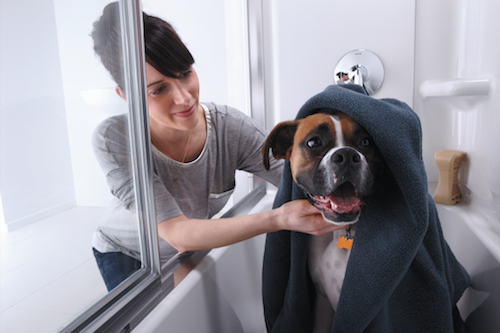 Whether you’re bathing the dog, your kiddos or want to relax in the tub – it just works. The Sterling shower doors with ComforTrack technology are available for both bath doors and shower doors. Look how happy this pup is and so is his owner who can comfortably wash her dog. 5. Be sure to brush your dog’s fur and clip his nails before you bathe him. You want all of the tangles out. Also, shorter nails means less scratching if they freak out a little. 6. If you’re using the homemade dog shampoo, wet your dog’s coat with warm water first. Next, spray him with the shampoo mixture all over and massage his coat with your fingertips to get a nice lather. Make sure you work it into his skin, avoiding the eye area. If his face is dirty, use a damp washcloth to wipe his face. 7. Use a towel to soak up the water from his coat. Don’t rub or you could matte his fur. You can use a blow dryer, but on a low and cool setting to avoid hurting him. 8. Comb out his fur to avoid tangles. 9. Give him a treat and tell him job well done! Do you have shower door with the metal edge? Watch the two (really cute) video clips below to learn a bit more about the Sterling Prevail sliding door. I leave you with two things…a cute picture of our dog Dart and a request. Please share your dog bathing tips with me! Is there a trick you use on your dog to make bath time more enjoyable?